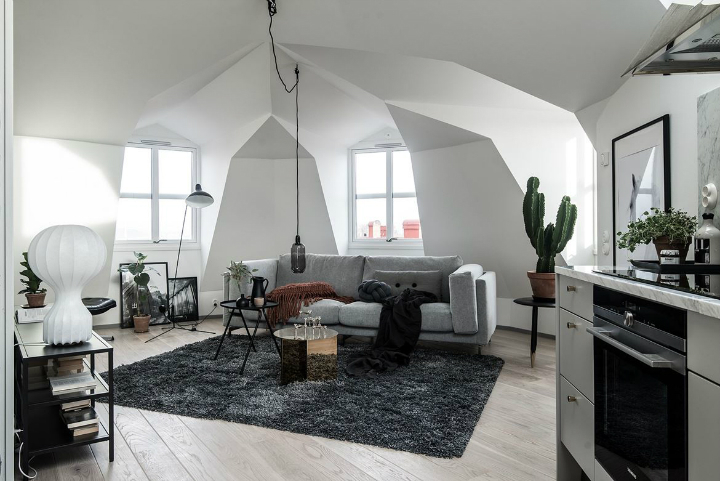 This Scandinavian gravity home is a sleek but cozy attic apartment that looks totally unique. We are loving the bold assertion of color paired with metallic and warmer elements– it’s genius! As you come into the living room area, you see that it exists in harmony with the kitchen. 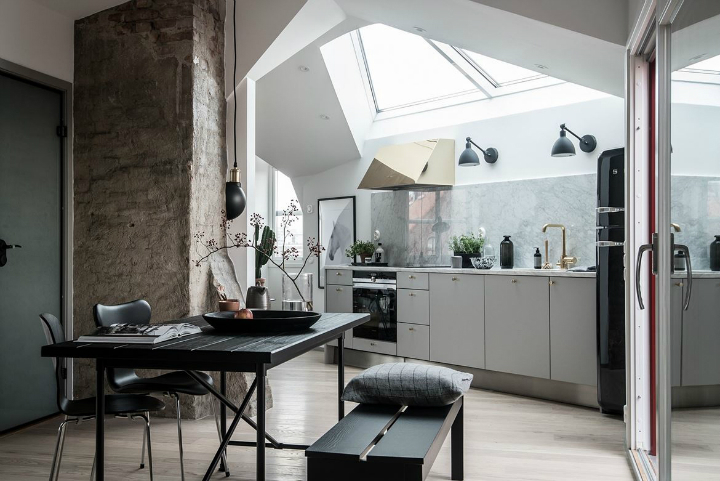 The kitchen is a stretch of white marble countertop separating a bronze sink, black stove, and a chic black refrigerator on the end. 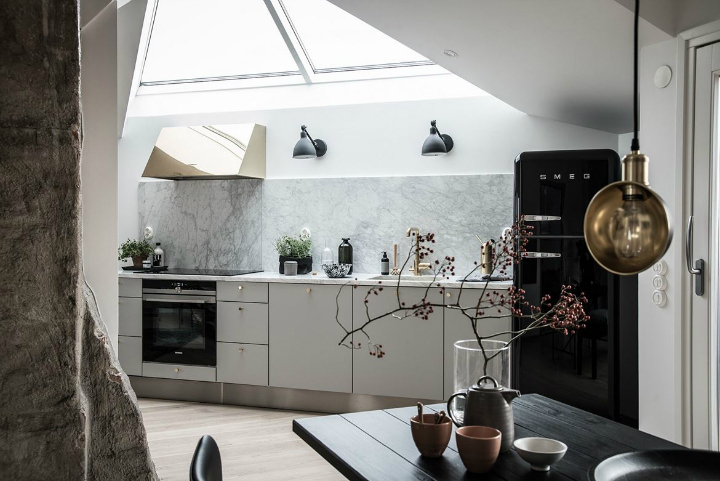 The wooden floors provide a warm contrast to the bolder, colder colors of the bronze stove hood, gray lamps, and statement gray marble (love!). Meanwhile, the living room is centered around a posh gray sofa perfect for reading. 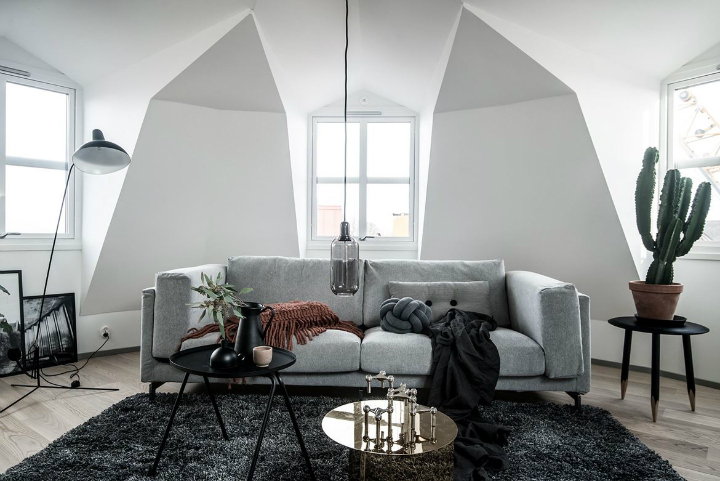 Throw a black rug down and let the accent pieces take over: cacti and plants, round black and gold accent tables, dark tables filled with books, white lamps, and black vases. 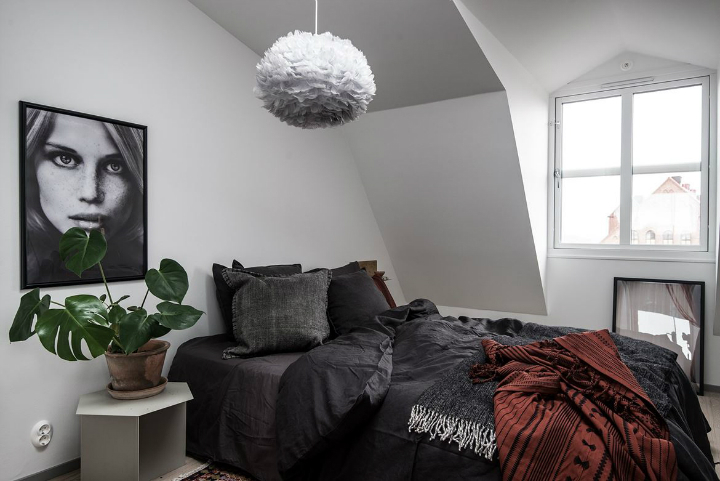 A hanging lightbulb and a geometric poster make the room complete. 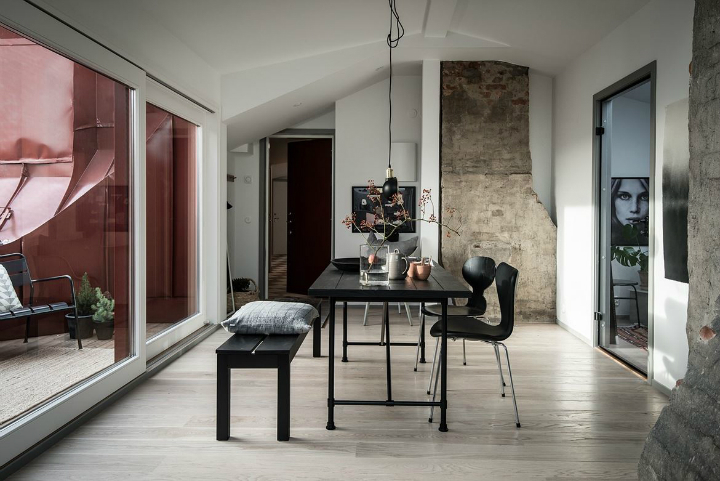 All black furniture with the table, chairs, and bench create a sleek effect in the dining room, contrasted by a warm stone chimney in the background.Take in the view or hang art on the walls to break up the solid nature of the stone and the white walls. An all-charcoal bed with gray and maroon throw blankets make this bed comfy and glamorous. Meanwhile, the white lamp, end table, framed photo and large plant round the look out. 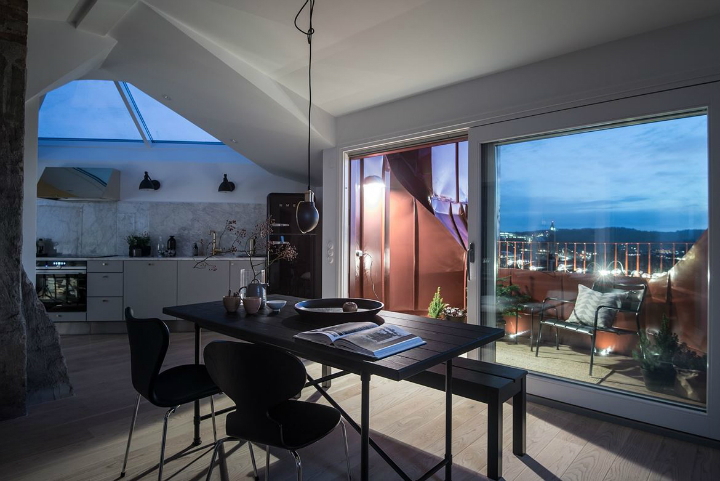 If you somehow cannot sleep in this room, you can always get a glass of milk from the kitchen and drink it under the soft backlight of the terrace. 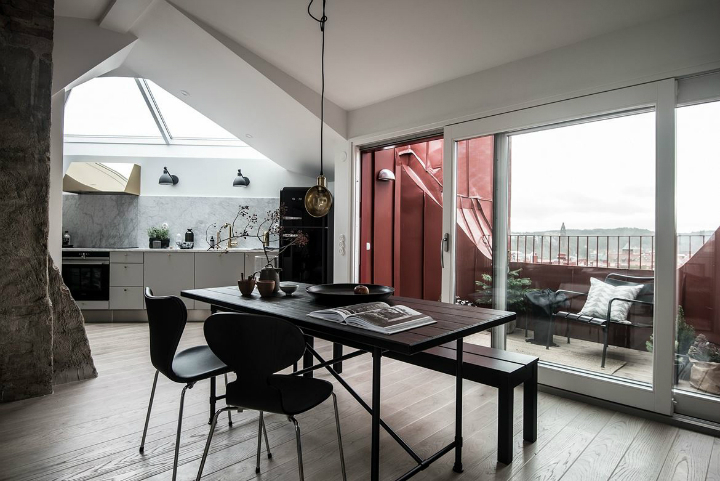 Soft and bold at the same time, you can’t help but love this Scandinavian hideaway. 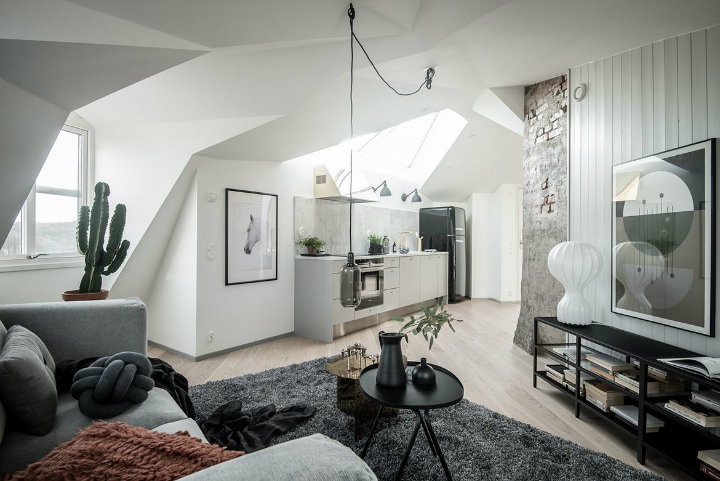 Are you in love with this apartment? What do you like the most? 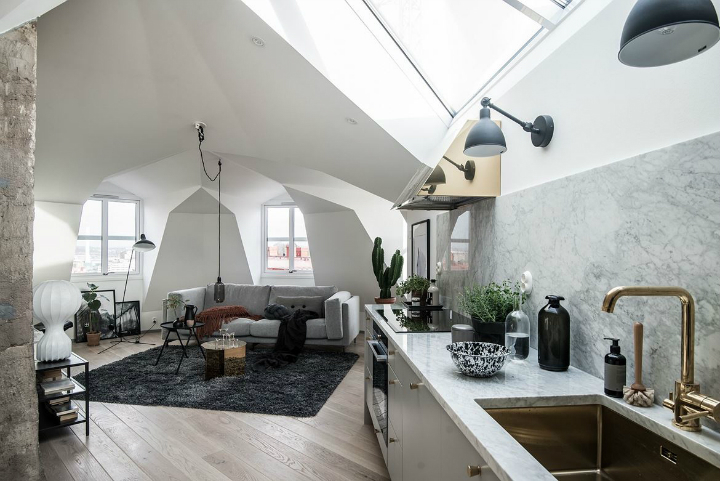 Comment and let us know what design inspiration you’re coveting most in this stylish home!